I only recently started using Miss Mustard Seed paint. I held out for a long time simply because it is kind of expensive. Then last summer I bought a sample of it at the Oronoco Gold Rush. As I feared would happen, I loved it. Damn! Now I drive all the way across the river to Hudson to buy it. Oh … who am I kidding … I send my husband all the way across the river to buy it. Thanks hon! Working with this stuff has a bit of a steep learning curve though. One problem has been especially prevalent with the green shades. The thing is, you don’t get the same color every time. 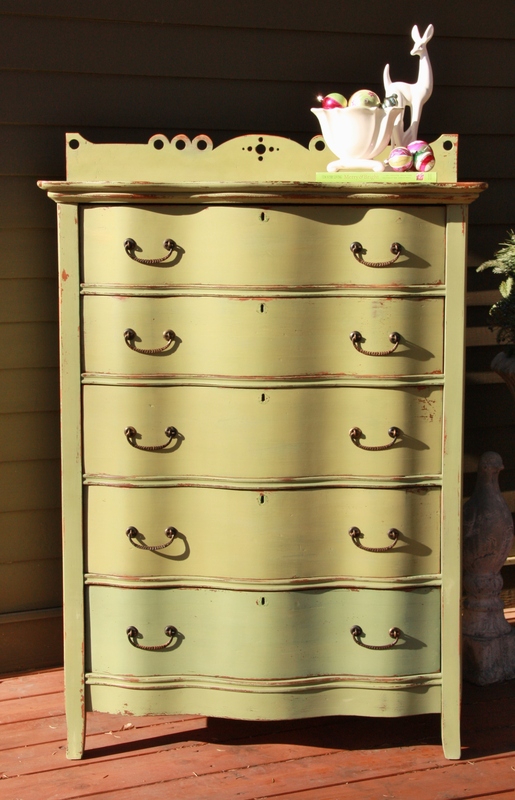 It started with a dresser I painted in MMS’ Boxwood. After painting it, I realized that one of the drawers needed to be completely sanded down and re-done (long story for another time). I was pretty new to MMS paint then, and I just decided to use the leftover paint from the first go around. 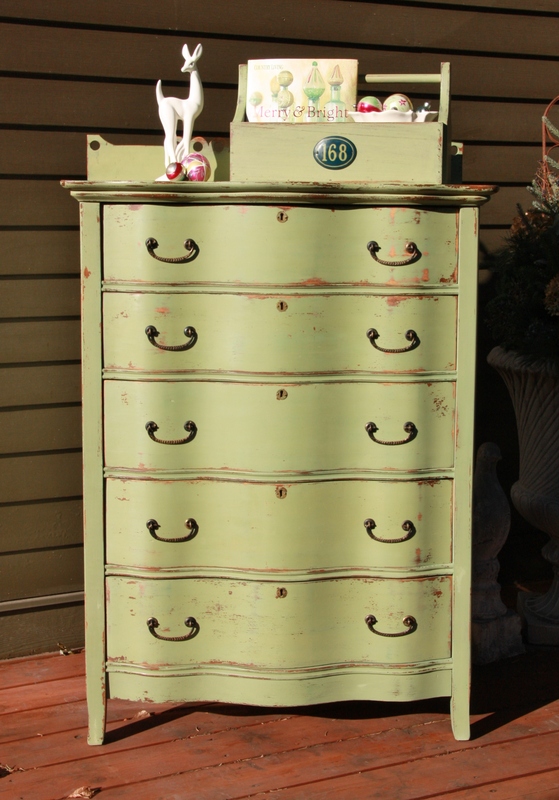 I gave it a good stir and repainted the drawer … and ended up with a totally different shade of green. Argh. In the end, I had to repaint all of the drawers with a new mix of paint. So really, I should have known better with the Luckett’s Green dresser. But yet, I did it again. One drawer needed repairs and was sent over to Ken for work. I mixed up the paint and painted everything else. This time I figured I could just mix up a new batch of paint for the last drawer. If it didn’t sit around with the pigments separating, I figured it would be fine. Surely it would be the same color, right? Yep, there it is. The bottom drawer. Not the same at all. I don’t know why this happens. I use the same ratio of paint to water. I am painting the same type of wood, with the same light sanding to start. Live and learn baby, live and learn. Next sometimes I fake it. When is your next CARRIAGE HOUSE SALE? I live in the area and would love to come have a look see! Thanks for your comment Mary! Just a clarification, I used milk paint (not chalk paint) on this dresser. They are different. I agree, driving to another state for the paint is a lot of work, but my hubby is half the way there when he visits his 96 year old grandparents every week! So, I just send him a little bit further, and he doesn’t mind. I’m lucky that way. As for the Carriage House Sale, we only hold it twice a year. Generally the 2nd Thursday & Friday in June, and some time in late September or early October. The dates for 2014 are not set in stone yet, but look for more info as June approaches. We’d love to see you there! I just had this same thing with Luckett’s Green. I painted a primitive kitchen cupboard. Then I thought the middle panels needed a second coat. I had some thick mess still in the bottom of my cup, so I added a smidge of water, stirred it up and as soon as the brush hit the panel I knew it was a different color. Luckily it was the panels, so I ended up painting them all a wash with the new color. I planned it that way all along, right? Pingback: purple and green! | q is for quandie.